A scenic trail in the Kachina Wilderness taking you from the Schultz Tank to the Doyle Saddle which overlooks the Inner Basin. 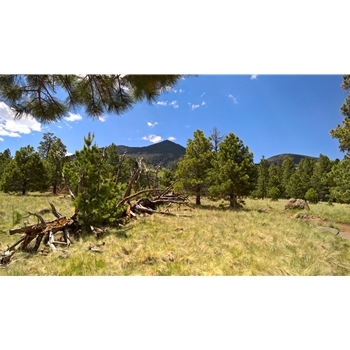 Accomodations: (on site) Toilets Water Camping Directions: Take the Highway 180 north of Flagstaff, 3.1 miles to Schultz Pass Road (FR 420). Taking a right, follow road 1/2 mile to the Elden Lookout Road where you will keep left. Once you cross the cattle-guard and road becomes dirt. Follow this dirt road 5 miles up the hill to the Schultz Tank parking lot which is well marked. The trail starts across the road on the other side of parking lot. Accessibility: Good dirt road, off-road vehicle not needed.